It has been two months, three weeks and four days since I assumed office on June 1, 2018. I stand here before you in awe and reverence of the collective dedicated service rendered by three American Presidents, followed by nine Filipino presidents over a total span of 117 years. Today, with Silliman University at 117, that spirit of service lives on! Ensure that the university leadership and operation observe the integrity of purpose, sound fiscal management, and financial viability. Certain phenomena in the global and regional arena could propel programs and actions in the academe. The Sustainable Development Goals (SDGs) of the United Nations are a universal call to action “to end poverty, protect the planet, and ensure that all people enjoy peace and prosperity.” Number 4 of the 17 goals in SDG 2015-2030 is Quality Education. The ASEAN Workplan 2016-2020 opens opportunities for higher-education institutions in Asia to work together to meet the collective national agenda and to foster harmony and equity among societies in the region. Higher-education initiatives today are generally couched in economic activities related to trade and services. There is preoccupation with league tables or university rankings around the world but these should not take ascendancy over the institution’s vision and mission that meet specific contexts, nor modify university strategies to improve ranking or simply be in the rankings game without due regard for the rationale and goals set forth by the founders of the institution. Certainly, Silliman University is poised to respond creatively and critically to these regional and global mandates. First, positioning itself aggressively and progressively as a champion for the Environment. This will set a coherent framework for all the environmental initiatives in practically all university programs, centers, and services. Program strategies across units can be aligned to maximize utilization of time, effort, and resources in the pursuit of environmental actions. This will articulate clearly environmental education and outreach across all disciplines and professional courses. Silliman University’s extension activities in Ticao Island, Pamplona Farm, and Silliman Farm can serve as showcases of environmental measures as we pursue agricultural production. We have departments and institutes that lend themselves naturally to environmental efforts. Support units and services from physical infrastructure and maintenance to hospital care can also play their part to enhance and enrich our environmental focus. About eight weeks ago, we launched the advocacy for zero waste management, which requires the participation of all sectors on campus and collaboration with the city and barangays. We are setting up targets to progress and more efforts are underway, such as curriculum mapping, research and community outreach, and sharing our best environment-oriented practices. It is never enough to emphasize the role of Silliman University in promoting environmental integrity and stewardship for the sustainability of our planet. This is a Christian declaration of the University’s unqualified stand on the care for the environment. One may ask: Where is Multidisciplinarity in whole-person education? If we believe that education is life, our teaching and learning must go beyond the narrow confines of our individual disciplines. The more we collaborate with other fields or disciplines, the better we are at approximating the truths we are searching. Promoting multidisciplinarity, linkages, and interpersonal networks as well as interactions between and among units builds skills and establishes fellowship and harmony among groups and individuals. What about Inclusiveness? With liberal arts education, we provide an atmosphere of inclusion more than exclusion. People of all creeds, personal and political orientations, work background, and socioeconomic levels can be part of a community of learning. The multiple sources of learning at Silliman allow for various perspectives and learning applications that help realize the educational aspirations of all who enter the gates of Silliman. What about whole-person education and Self-direction and Social responsibility? Higher- education institutions have their own goals and purposes for individual students but these must be coupled with instilling wider social responsibility. Excellence in programs and services being provided to students is not an end of itself; this should become an instrument for a higher purpose like rendering service to improve communities and meet national development agenda. Third, cultivating partnerships. Silliman University is 117 years old. Over the years, the University has amassed significant human, social, political and cultural capital that could be tapped through partnerships in advancing the goals of the university. Program partnerships require clear programmatic framework, interlocking research and community service with teaching, and dovetailing powerful institutional agenda with key educational messages. Steering toward the above directions is our Development division, where a new Office of Strategic Partnerships has been set up. I call for breaking down the silos in higher education. We often say that higher education has the functions of teaching, research, and community service. Yet, these are viewed as individual silos with little chance of integration due to how we structure a college or university and how members of a learning community approach these functions. Let’s break away from the tendency to look at teaching as a silo separate or dissociated from the silos of research and service. A significant step now is to actively build their interconnections by answering these questions: How can teaching be enhanced by research and service? How can service gain value from teaching and research? How can research enrich teaching and practice? The University can actively integrate in teaching the functions of research and service. In the academic division, steps are being taken to pursue this plan. In a globalizing higher education, a university is expected to contribute to the body of knowledge through research and service. It must be a producer of knowledge, not simply a consumer of knowledge. Thus, Silliman University must restructure and retool its faculty and staff to achieve some level of integration in the teaching, research, and service functions of its human resource. Reskilling for education in the 21st century entails active promotion of digital and IT tools in teaching and learning. Coding and other learning management systems must be pursued as early as in our basic education classes. In the academic division, steps are now being taken toward this direction. In keeping with the nature of a university, I will adopt a rational-empirical approach and empower the constituencies – students, alumni, faculty, and staff – to become their own agencies for change. I will safeguard and strengthen the integrity of university procedures and processes. I am duty-bound to ensure that the University leadership and operation observe sound fiscal management and financial stability by demanding transparency at all levels of operation. Our Finance and Administration division takes the lead in this regard. Leadership in the university is service beyond measure. As the baton of university leadership is handed over to the next administration, one must be truly cognizant of the legacies of previous administrations and must honor the positive outcomes of hard work by ensuring that programs with impact are sustained over time. We can only contribute to global education if our programs and services meet the standards of the industry. One strategic approach to widening our reach is to build programmatic partnerships with local and regional colleges and universities and connecting with our partners’ other partners outside the region. For example, forging a partnership in the area of nutrition with a university in Indonesia will connect us to that university’s partners in the Netherlands and Australia. By the same token, an institution in India that will establish academic partnership with us on tropical diseases will give us access to that Indian institution’s partners in the US. This is an approach that is Asian in outlook but looks beyond for global reach. Partnerships among institutions within our easy reach can serve as building blocks for forging regional cooperation, and eventually, for reaching out toward global cooperation. The aspects of Programs, People, and Partnerships are to be viewed as interlocking systems in our institutional needs analysis, planning, implementation, and periodic assessment. Whatever is the entry point, say, a new opportunity to offer an Intensive English Program for students from Japan, will bring about renewed enthusiasm among our People – our faculty – in the review, update, and delivery of their teaching modules. And this Partnership will broaden and widen our reach and bring about active understanding of the ways and practices of a highly developed neighbor in Asia. Or take a possible collaboration with a medical army institute in Egypt that is interested in availing of the talent and skills of our People in the Faculty of Nursing to train Egypt’s nursing students. This leads us to look closely into the cost-benefit analysis of partnerships, and the absorptive capacity of our people and programs. Or take the case of retooling our own office staff in information and digital technology. 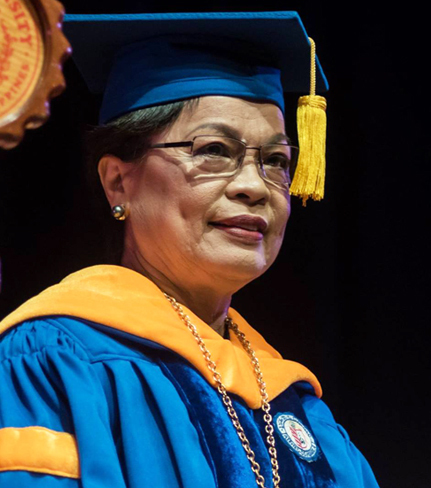 The entry point is the reskilling of People that requires the College of Computer studies to develop a training program and partnering with our Human Resource Development office. Meanwhile our advocacy for Zero Waste Management is a combination of programs (academic and support services), people (students, faculty, staff), and partnerships (with government and non-government institutions, including community-based organizations). Viewing things this way, I see a clear trajectory for the vision: Via, Veritas, Vita for the nation, Asia, and the rest of the world. Silliman by the sea. Sail on Silliman University!